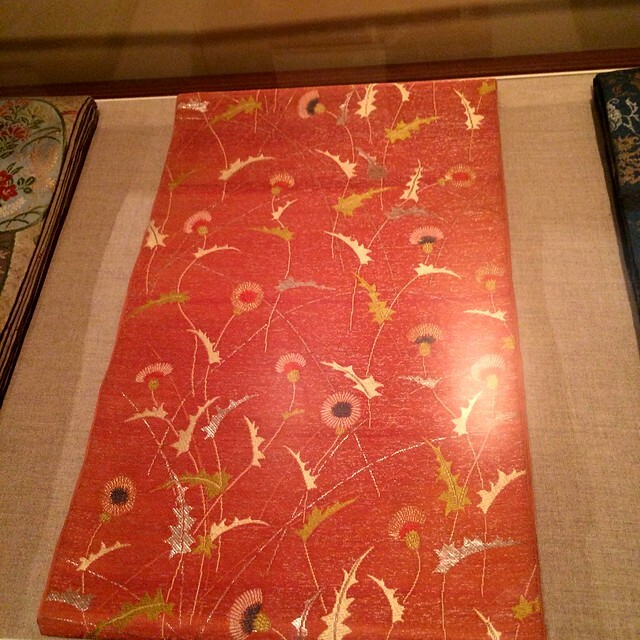 I recently stopped by the beloved Metropolitan Museum of Art (from which I now live a mere three subway stops away!) 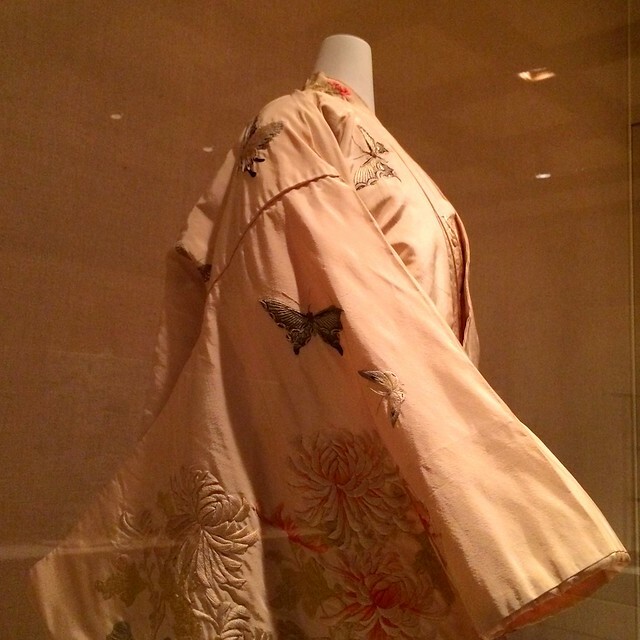 to catch the gorgeous exhibit Kimono: A Modern History before it closed. What an incredible treat! 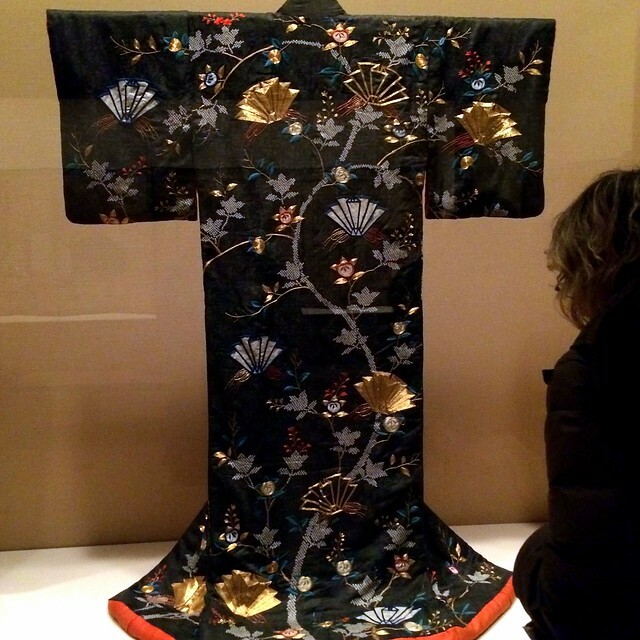 I was stricken by a bit of wall text describing the word kimono as basically “a thing to wear,” and how that has changed from the Japanese equivalent of a t-shirt or sweater into the beautiful, intricately-detailed historical costume that more typically comes to mind in the West. 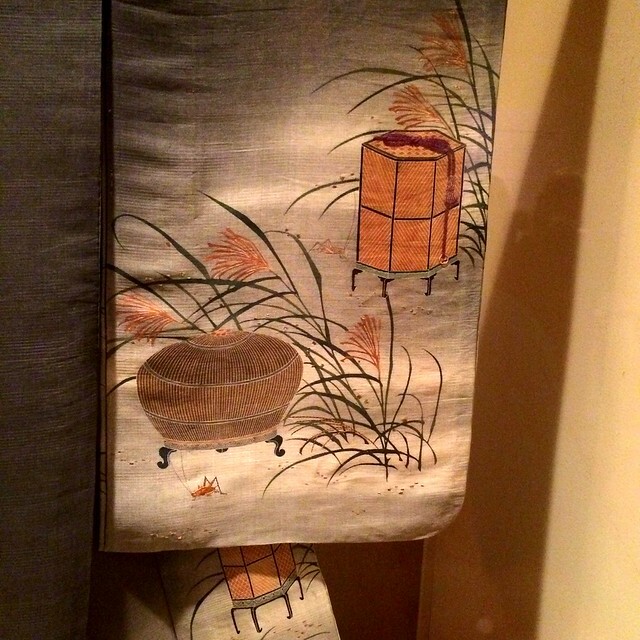 The exhibit was wonderfully presented, starting with traditional Edo Period kimonos, incorporating the kimono into contemporary fashion of the 1920s and 30s, and eventually presenting playful printed cotton under-kimonos that reminded me so much of men’s boxer shorts today. 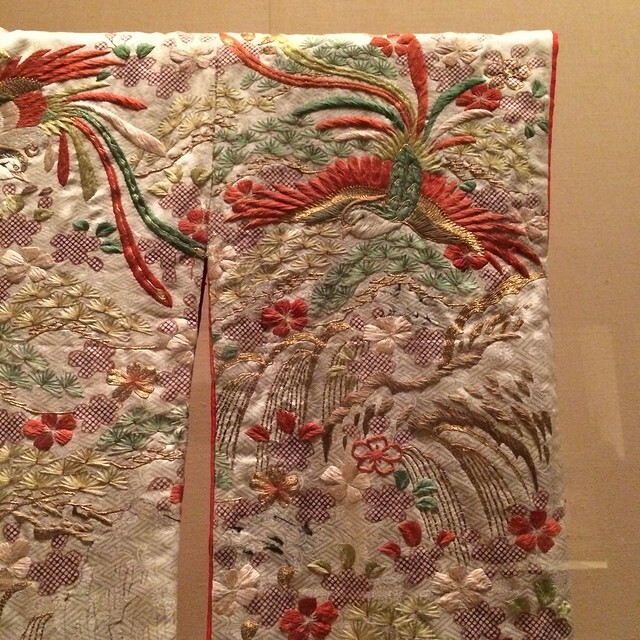 I was truly dazzled by the embroidery and details, and though I apologize for the iPhone-quality photos, I hope you’ll be able to see what was so enchanting about these pieces. 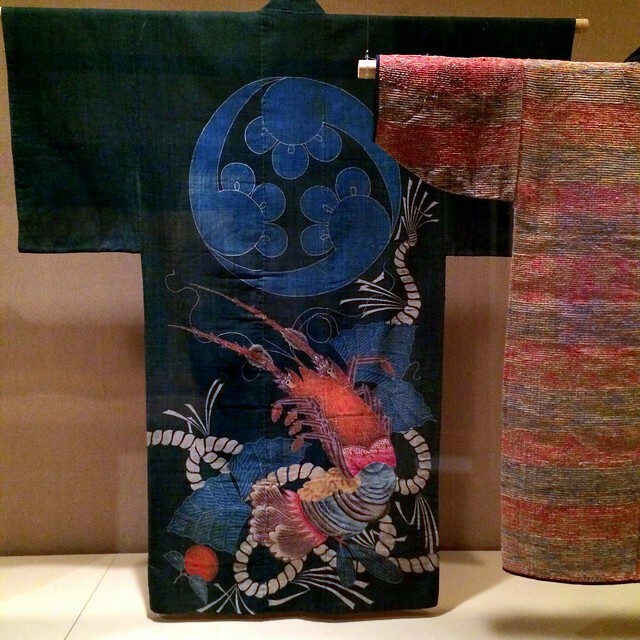 I was so charmed by the dyeing technique and gorgeous design of a plain cotton kimono. 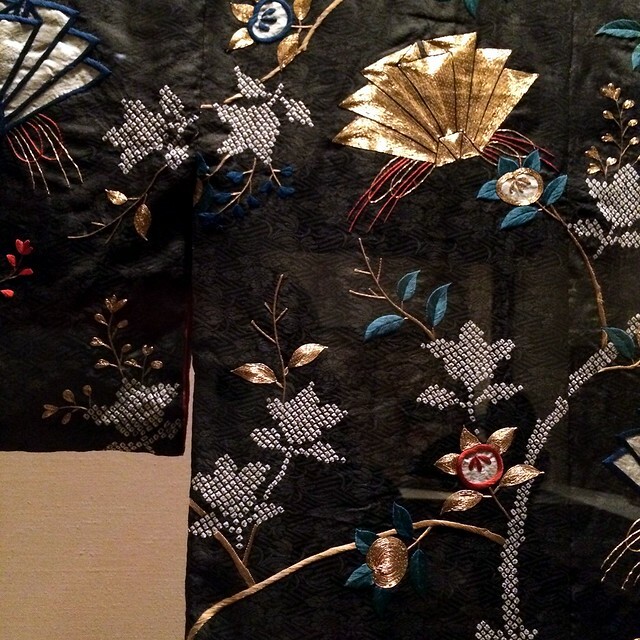 I loved a section that discussed how the kimono and details were blended with and incorporated into Western fashions for export. 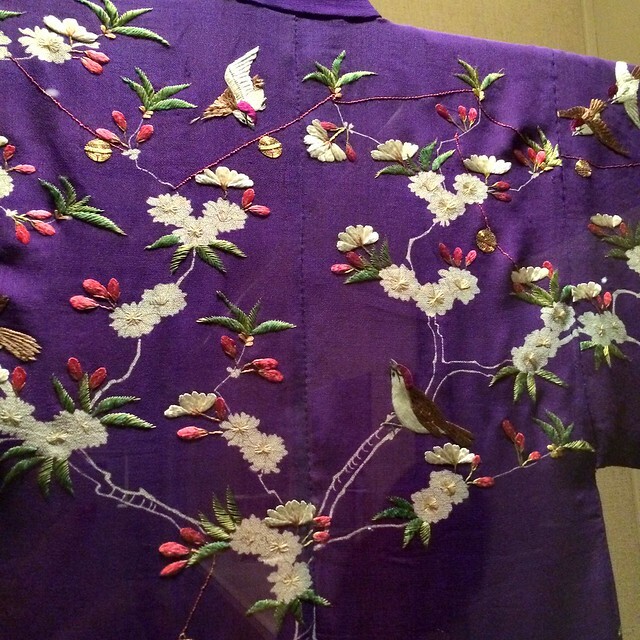 And it just plain blows my mind that such a beautiful garment would be available in a department store as a souvenir. 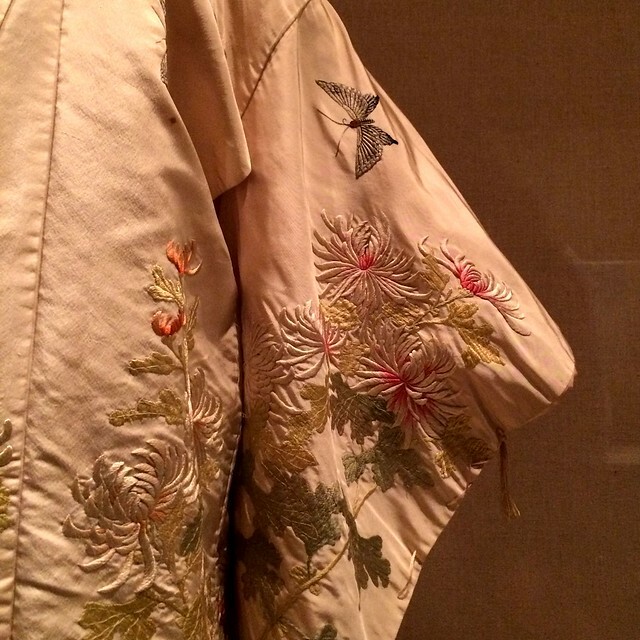 The way these birds and flowers were embroidered is just exquisite. 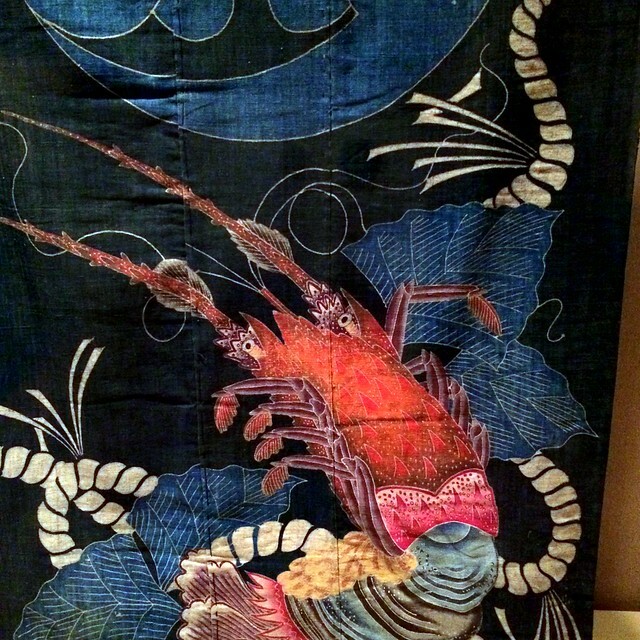 Whenever I spend any time with Japanese art or culture, I wish I knew more about Japan’s history and aesthetics. 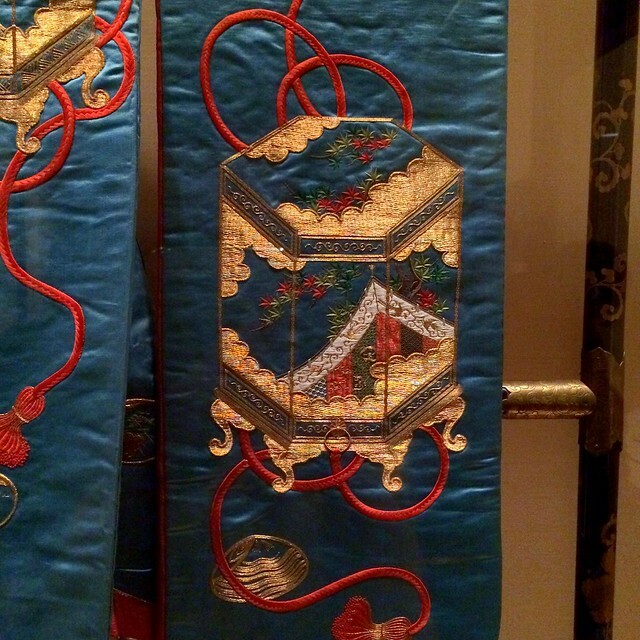 I was so enthralled with the different types and styles of embroidery and textile treatment that my mind is still spinning. 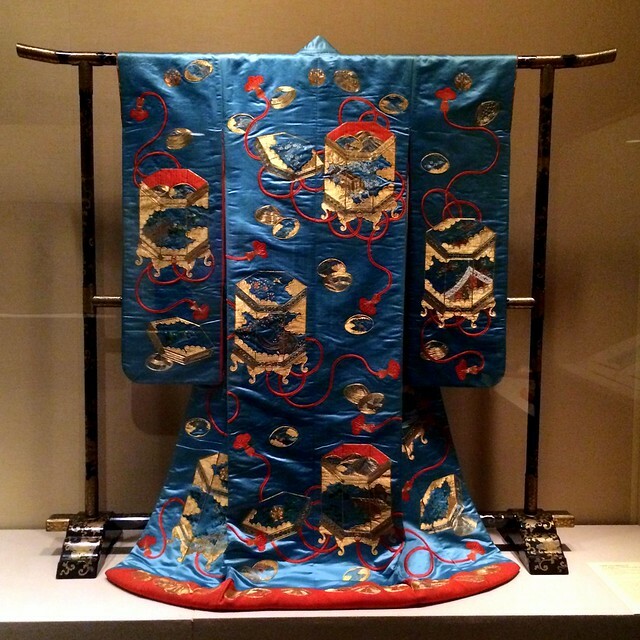 In addition to adding fuel to the fire of my wish to learn embroidery and to do more with textiles, it made me intensely curious to learn more about Japan and the art of the kimono. 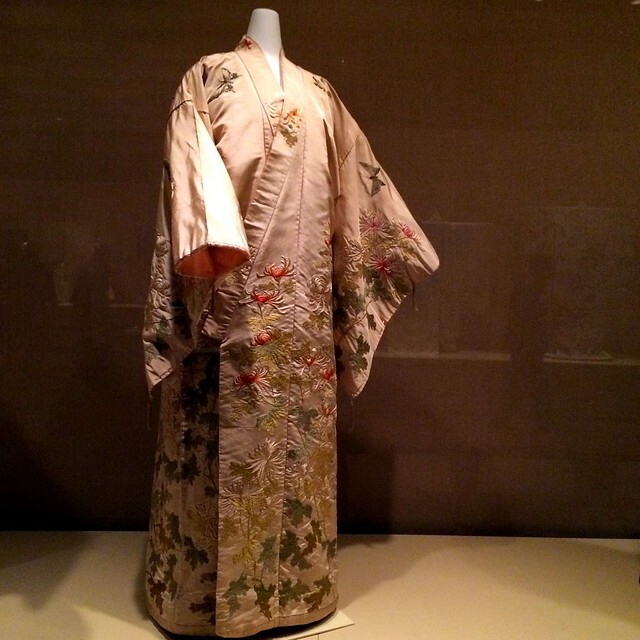 If you are like me, I’d recommend the exhibition catalogue by Terry Satsuki Milhaupt (currently sold out on the Met’s site) or watching the wonderful Sunday at the Met – Kimono: A Modern History lecture online. I did something today that was simultaneously unusual and utterly in keeping with my most ingrained habits and tendencies. 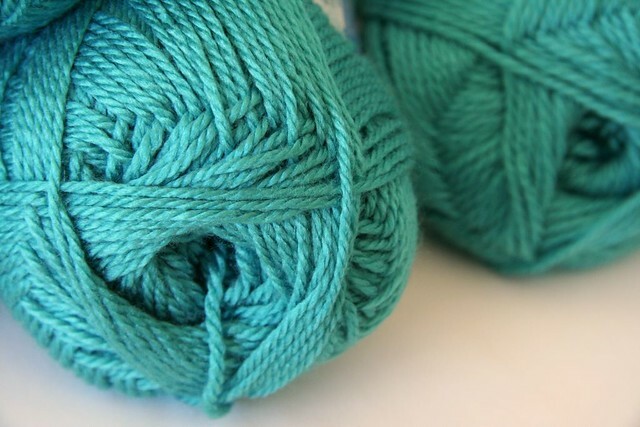 I cast on for a new project. I’ve been at my job just over a year now, and I truly love it. I recently got a very nice promotion, so apart from the few weeks where I rarely left the office before 8pm, it’s going swimmingly. The downside is that its demands plus my still very long commute leave me with little time or energy to do the crafty things I used to enjoy so frequently at home. My company is closed for the next two weeks, so I am trying to take advantage of the time off to get my home life back in order. While ordering Roman shades for my bedroom (I’ve been living with the vinyl blinds my landlord provided when I first moved in back in 2010… which I’ve since broken) I also did a little bit of online clothes shopping for some summer pick-me-ups. I’m pretty picky about the value of clothing, especially after working in retail and coming to really understand the vast difference between fabrication, wholesale, and retail pricing. I bought two more pencil skirts just like the dozens in my closet, and while they were seriously marked down, I kept thinking, “These things have three, maybe four seams and a zipper. Why do I routinely spend so much money on something I could so easily make? 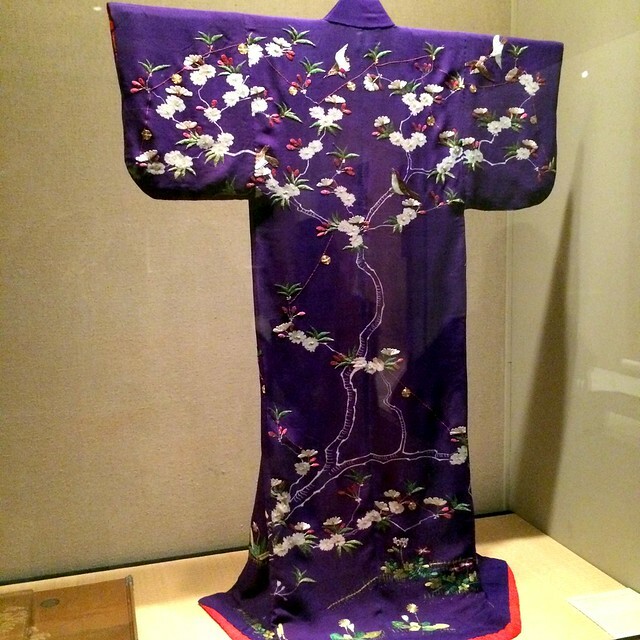 !” I have owned a sewing machine for years (it may or may not still be in working order). 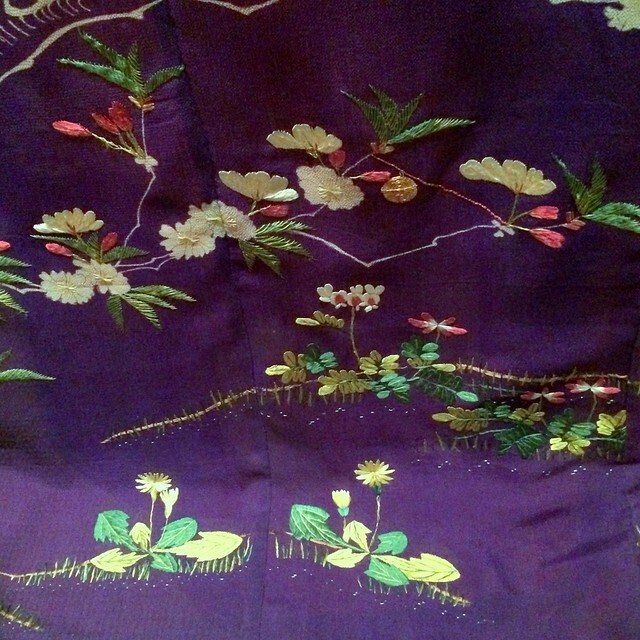 Back in 2007, I bought two patterns and fabric (which has all since been lost or wrecked) with the sincerest intentions to learn to sew skirts and dresses. But I never sealed the deal, and I have no idea why not. Another thing that occasionally troubles me when buying clothes (especially at such discounted prices) is that I can’t really know if they were produced in ethical labor conditions. I try to shop only from companies with solid reputations, but unless you are making the clothes yourself, you can’t actually be sure that no one was exploited or mistreated for your super cute new sundress (not that this qualm has stopped me from buying anything lately – but it does hover in the back of my mind). 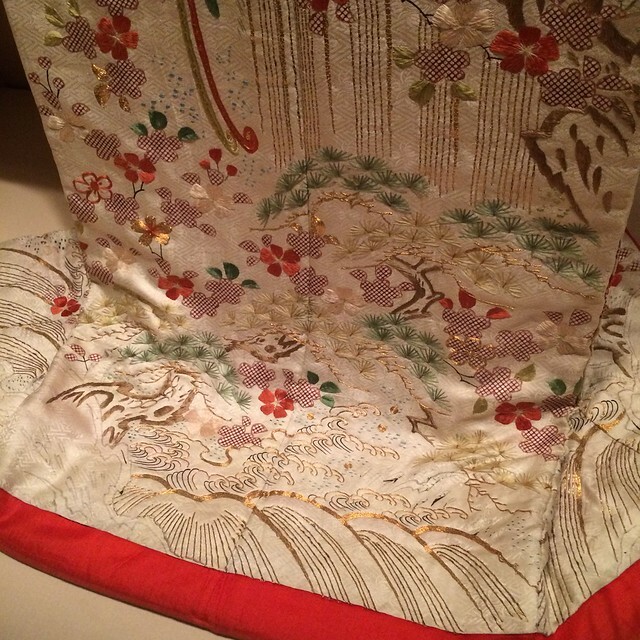 It is my hope that I can learn to sew basics like skirts and dresses, maybe even blouses, and that in addition to benefitting from custom sizing and choosing the fabrics of my dreams, I will no longer have a closet full of morally ambiguous textiles. 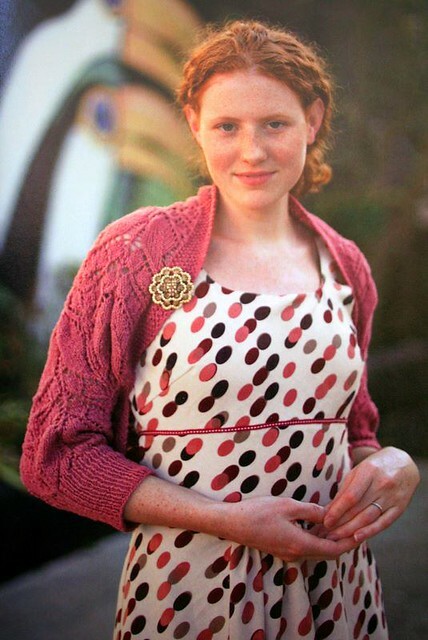 The Viennese Shrug, from Interweave Knits Summer 2005. I’ve been wanting to make this lacy shrug since 2007 (I had a lot of good ideas back then) and just like my intended sewing projects, somehow never quite got around to it. But that good-intentions-poor-follow-through habit is precisely the one I plan to break, starting now. Something I’ve alluded to but maybe not directly stated is that one month ago I started a full-time job in a fairly conservative, upscale office. I love my job, and I’m happier than I ever imagined being every day (thank God). I did notice, though, that my wardrobe was a bit of a mish-mash of pieces that didn’t immediately seem to add up to higher-end business casual attire. 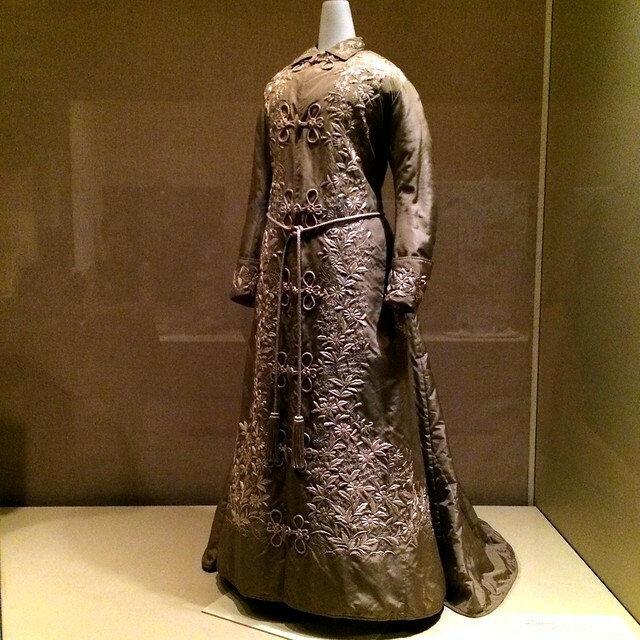 I read a very helpful article on Jezebel, How to Dress for Work, and I adopted the advice of a sort of “work uniform,” the same type of clothes layered together each day. For me it’s been either pencil skirt + blouse + cardigan, or dress + cardigan, with stockings and heels. Simple, easy, and surprisingly comfortable. You may notice that the word “cardigan” appears twice in my work uniform repertoire, and you would correctly assume that I have a lot of cardigans in my closet. My love and need for cardigans was one of the big reasons I learned to knit years ago. So as I look through my queue and think about projects I’ve imagined myself wearing in some distant future, my focus has now turned toward the more “business casual” or office-ready garments. 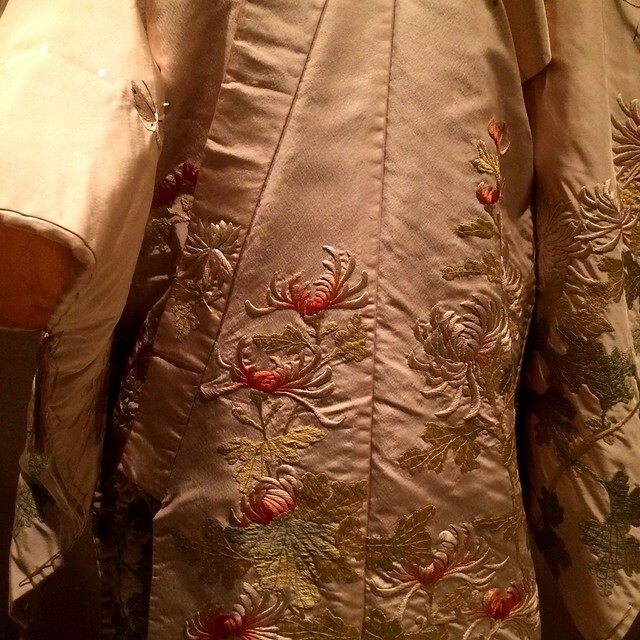 My definition of office-ready may be a little different or pickier than others’, but for the time being, I am seeking flawlessly-finished (in my parlance, that would be seamless), finer-gauge, classically detailed, versatile styles that still have a bit of visual interest and personality to them. That works out rather tremendously because those are exactly the type of sweaters I most enjoy knitting anyway. 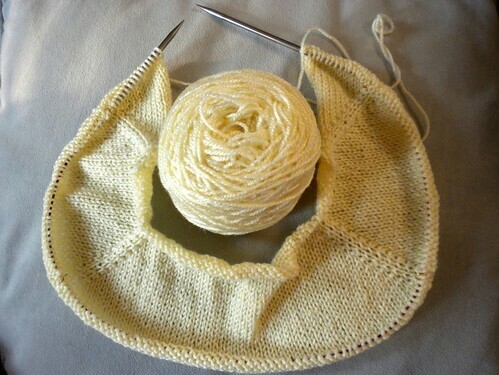 One such endeavor is the lovely Summer Waves Cardigan (PDF), which I’ve started above. I’m planning to lengthen the sleeves, and I’m toying with adding one of the lace repeats from the collar band to edge the sleeves. 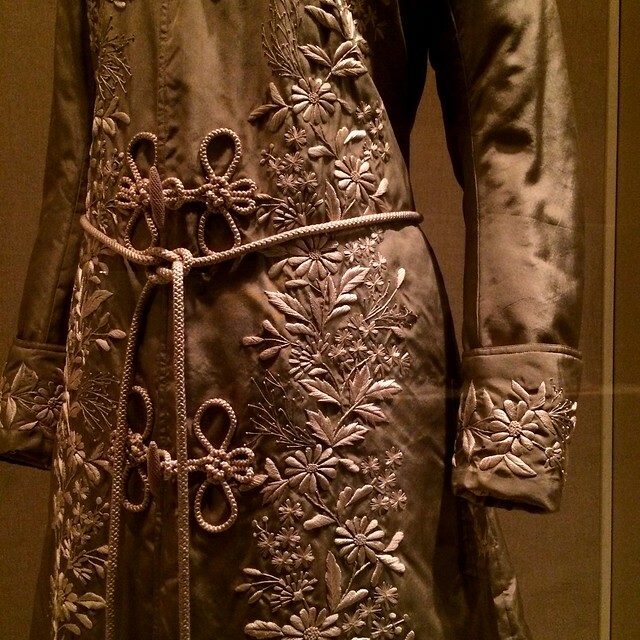 I picture wearing this over a summery dress, with a skinny belt. 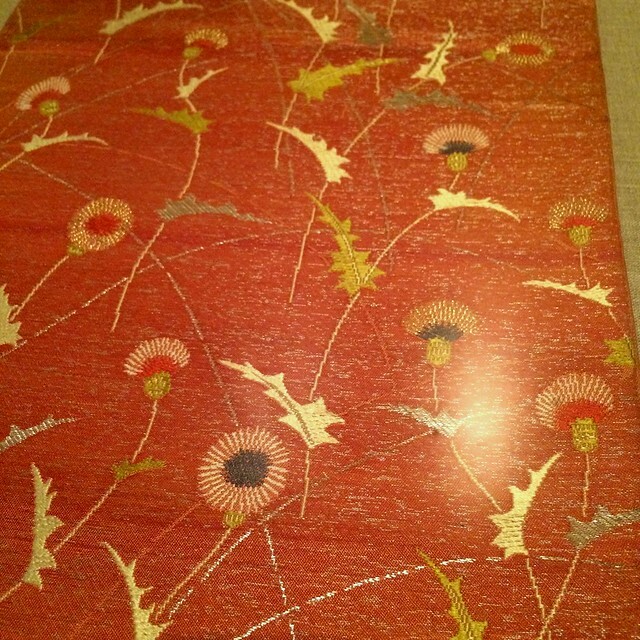 I hope it looks as nice in the office as it does in my imagination!